I love reading quotes. It’s amazing how a simple, short line can instantly change the way you’re feeling. The more quotes I collect, the more I notice that there are three people for me whose quotes stand out in particular. Osho, Lao Tzu and Rumi have stated words that connect with me so deeply, and each quote never fails to amaze me. The wisdom they left behind is eternal, and something we can all be grateful for. Quotes are something that bring me comfort and reassurance. 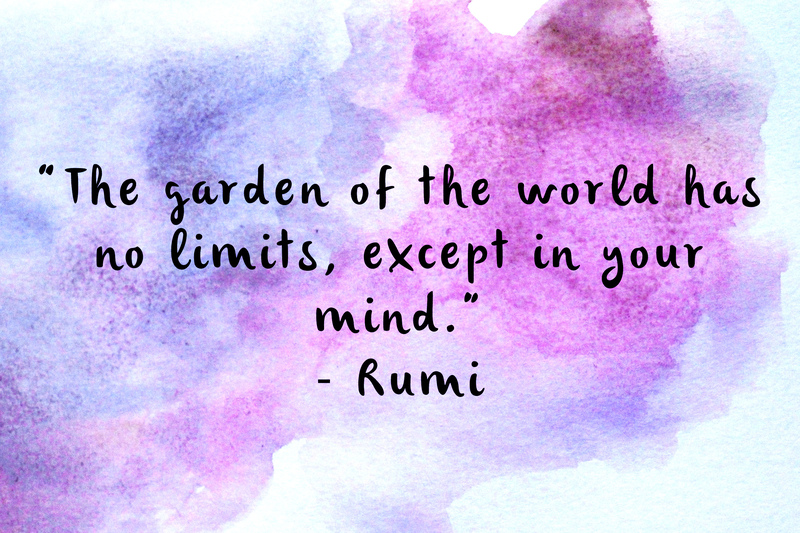 The words of Rumi in particular are something that deeply resonate with me, and leave me feeling inspired. I enjoy so much of his writing, however there are three quotes that really stand out for me, and I wanted to share them with you. They are so beautifully written and I hope they will inspire you as much as they do me. For the quotes I chose to share, I made the images by painting the backgrounds with watercolour paint onto paper, and then I photographed them and edited the images for displaying them. This might just be one of my favourite quotes to exist. I read it daily for inspiration, and it gives me that feeling of belief in achieving my dreams and desires. I instantly feel like anything is possible, and reading it gives me the reminder to trust in my work and intuition. This always brings me the reminder that we are made of the same matter as the stars, the air, the universe. Seeing it brings me back to myself and connection with the earth – which is so easy to feel disconnected to today. It’s also a great sentence to read when you feel small, or down. It’s a reminder that we all have a role, and are unique individuals. Each of us is special and contain everything we need within ourself. We constantly create and imagine scenarios in our minds, which can easily bring us torment or joy. This quote always reminds me to keep control of my thoughts and keep them as positive as possible. Our minds have much more control over our reality than we think, and it’s so important we maintain a positive outlook on life, and be grateful for what we have. We create our own happiness, and anything is possible when we have the right mindset. 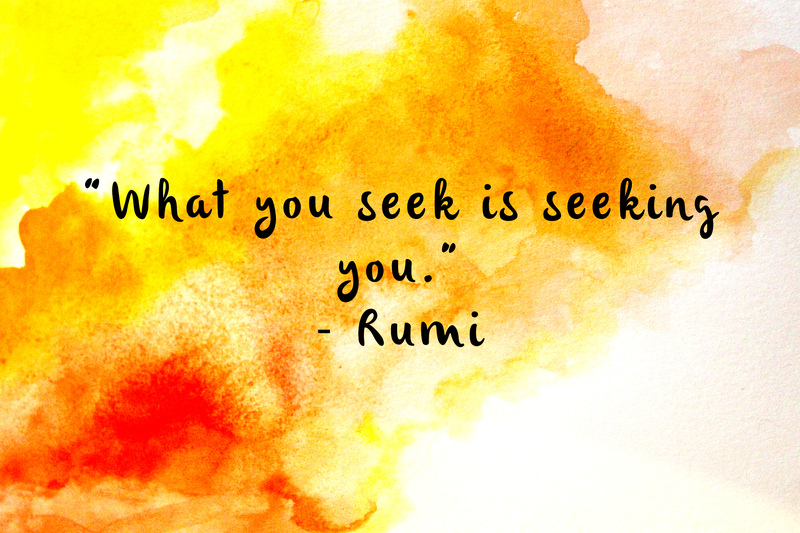 I’ve read one of Rumi’s poetry books, and it amazes me how much wisdom one person is capable of having! You’ve defiantly picked the best of his quotes! Hi Ruya, I know it’s so inspirational! You should read one of Osho’s books, I’m sure you’d love them :). Thank you! Harriet, I love Rumi and these quotes are beautiful. The first one really speaks to me and it’s now my background. Your creativity with the watercolors and photography really make these even more special. Thank you so much for sharing them. Hi Maggie, thank you so much! I really love that quote, and I’m so glad you made it your background – they are such great words to keep for inspiration 🙂 thank you again! I often seek positive images and quotes when I feel overwhelmed. I love your watercolor. These would make lovely greeting cards! Thank you for brightening my day! I was searching for Rumi quotes with beautiful backgrounds, thanks a lot. 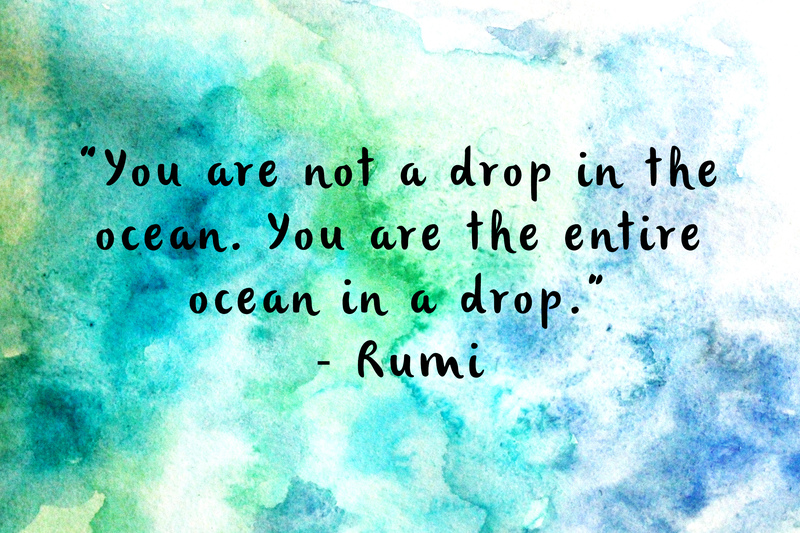 I’ve only just discovered Rumi! All three quotes resonate with me but they were made more beautiful by your background watercolours. Thank you! Dear Harriet , I love how you blend words with colours! is it possible to publish one of your images on Facebook with the due credits? How would you like to have them posted? I will credit you on a post if I use one. Rumi writing is amazing , I changed my way of thinking ..